FILE - U.S. Defense Secretary Ash Carter greets Army Lt. Gen. Sean MacFarland after arriving in Baghdad, Dec. 16, 2015. Carter is on a weeklong trip to the Middle East. Defense Secretary Ash Carter said Friday in Afghanistan that the U.S. military possessed information suggesting that Islamic State was seeking an opportunity to establish bases in Nangarhar province. Pro-IS extremists are said to have established roots in remote districts of Nangarhar and neighboring Kunar province and have recently carried out attacks against Afghan security forces. Carter acknowledged that the current fighting season had been tough for Afghan security forces, and that they had suffered significant casualties. “The Taliban’s advances in some parts of the country, even if only temporary, underscore that this is a tough fight and it's far from over,” he said. The Pentagon, in a report released to Congress this week, painted a grim picture of the security situation in 2015. It found that Afghan forces had suffered 27 percent more casualties than in the previous year, while high-profile attacks in Kabul had risen by a similar amount. During the current fighting season, the Taliban briefly overran the key northern city of Kunduz, while Afghan security forces have been struggling for weeks to flush the insurgents from southern Helmand province. The Taliban advances prompted President Barack Obama to reverse plans to reduce U.S. troops to a small embassy-level force in Kabul. Under the revised plans, around 10,000 American troops will stay in Afghanistan through most of 2016. Carter predicted that the next fighting season would also be hard. But, he said, the United States is working closely with Afghan security forces to enable them, in the coming months, to use their own air support against the Taliban. Afghanistan President Ashraf Ghani’s national unity government has come under fire for being unable to improve security and economic conditions, or to deliver on promises of electoral reforms and reduced corruption. Ghani took office in September 2014 after a U.S.-mediated power-sharing deal with election rival Abdullah Abdullah, who is serving as the chief executive in the unity government. 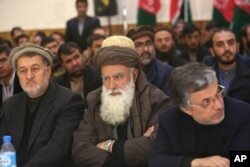 Former Afghan warlord Abdul Rasool Sayyaf, center, attends the inauguration of the Afghanistan Protection and Stability Council in Kabul, Afghanistan, Dec. 18, 2015. But the government has not made any significant progress on commitments to end the war and improve the economy, with unemployment at around 24 percent. Frustration over the lack of progress has prompted the emergence of a new political grouping calling itself the Afghanistan Protection and Stability Council. In their inaugural speeches in Kabul on Friday, its leaders said they wanted “fundamental reforms” in the country's governance but did not seek to destabilize the government. This is the first political party to have been set up in Afghanistan since the Taliban was dislodged from power in 2001. Analysts say they do not see the group posing a serious challenge to the Ghani government, noting the presence in its leadership of politicians who had been part of the previous administration. Some had been blamed for allowing corruption to deepen its roots in government institutions.